Daddy’s Muesli was unofficially born in our kitchen here in Port Townsend, a small Victorian-era town perched on the tip of the Quimper Peninsula which is perched on the Northeast tip of the Olympic peninsula in Washington state. Needless to say, we are basically out in the sticks! We used to purchase 25lb boxes of pre-made muesli from other companies, until we realized that we didn’t like some of the ingredients we were paying for. So instead, we bought lots of different ingredients and started experimenting with our own recipe. After a few years of tweaking the ingredients we came up with the recipe that more and more people are now enjoying. We started producing muesli in a rented commercial kitchen in the summer of 2010 and have been selling at farmers markets and natural food stores ever since. We continue to grow and are excited to see our list of devoted eaters get longer and longer every month! Over the years that we produced our muesli for personal use in our kitchen, our young children would want to eat some and they invariably asked if they could have some of daddy’s muesli. So when it came time to produce on a commercial level the name stuck. The baby on the front label is Tim, who happens to be Daddy! This photo was taken when he was 11 months old and reported to be the only photo of him at this age. His mother knit him the little blue suit that he is wearing. Tim is also pictured on the ‘Daddy Seal of Approval’, shown in a happy state in Thailand in 2006. We are Tim Lambert and Sheryl Morgenstern and have been married and best friends for over 21 years. We have two children, Rosie (19) and Cameron (16) and Tibby the Cat. Born and raised in England, Tim came to the USA in 1981 and has lived in Port Townsend since 1989. He is a goldsmith by trade but is also enjoying the process of growing our muesli business! Sheryl has lived in the Pacific NW for most of her life and has lived in Port Townsend since 1991. She has worn many hats over the years and is a Licensed Massage Practitioner. An avid baker, she recently took up knitting with great enthusiasm, knitting 5 hats for Christmas presents within a month! We moved to a small town to raise our family in a place where everyone would know our children and would look out for them as much as we would look out for their children. Living here is like living with a large family and we love it! We live in our hand-built straw bale house on 3/4 of an acre where we try and grow as many veggies as possible and will someday have chickens. If Rosie has anything to say, we won’t have chickens until she moves out! We are committed to living as lightly on the earth as possible, both in our personal and professional lives. This principle guides the growth of our little business and that is why we offer our products in bulk in order to reduce the amount of packaging waste that we contribute. We have fought hard to keep to our principle instead of bowing under to selling our muesli in big, bright and wasteful packages. When possible, we hand deliver our muesli in food grade buckets and then exchange them for full ones when they are empty. This means there is zero waste when we sell wholesale! Everyone is fine and life is chugging along here in PT. What fun! I seem to remember sharing muesli breakfasts with you, many years ago. I think Tim turned me on to trying apple juice on it instead of milk. I look forward to trying your product. I was at my local Metropolitan Market today hoping to find Daddy’s Muesli. I didn’t and so I talked to the store manager (Mike in Queen Anne) who said he would look into it and seemed very interested as you are a local company and organic. I know you are at Whole Foods – would love to see you at Metro Market too! Yours is the first muesli I’ve really liked! Thank you! Thank you guys for working so hard to put this into production, we’ll be buyers for life! Hi Alexx: So sorry for the delay in responding…I only just saw your message! Thank you so much for your accolades; it means everything to me to hear your approval of our product! And thanks for your support! I’m a retail buyer interested in your product, and can’t seem you find your contact info. Can you let me know how to buy your product wholesale? Hi Carolyn! Sorry for the delay!!!! You are one of a string of messages that I’ve just seen! My email address is: daddysmuesli@olypen.com. Our process is pretty simple at the moment: We sell 25lb bulk boxes for $124.75 to our wholesale accounts. At this point we don’t have a sealed 1lb or 2lb bag but will work on that diligently so that we have that to offer. I look forward to hearing from you if you are still interested. Hi Matthew: I am so sorry for the delay! I only just saw your message today as I didn’t realize, for some reason, that I had a long string of messages on the site! 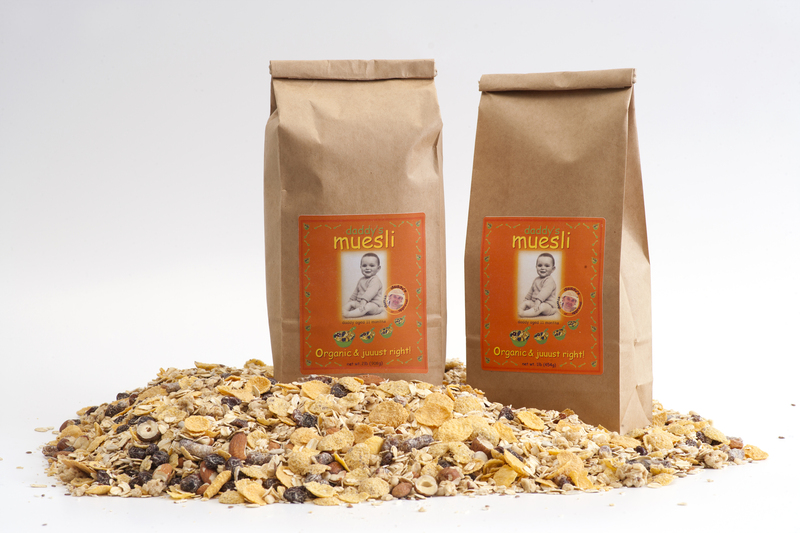 Thank you for the compliments on our muesli! We would love to have you serve our muesli at your restaurant if you are still interested after all this time. The best way to contact me is by email at: daddysmuesli@olypen.com if you are still interested. Dear Tim and Sheryl: I bought a bag of your muesli at the Ballard Farmer’s market recently. I make my husband breakfast every day and I like to provide him with a variety of healthy choices. I am happy to report that he really likes your muesli. However, I do have one suggestion. I was surprised that the 1 lb bag didn’t have a tamper-proof seal. Since I got the product directly from you, certainly there is no concern regarding the integrity of it. Since we wouldn’t be able to make it to the market all the time, I am looking into getting it from retailers or Amazon. So my question to you is when you ship your product to these distributors, do they come in tamper-proof packaging? Thank you. Hi Emily, sorry about the delay in getting back to you! I’m not very savvy in regards to seeing the messages from our website so only just saw yours. You’re right that they don’t have tamper proof seals. The bags that I sell on Amazon.com which I ship myself are exactly the same. I also ship larger amounts both myself and now on Prime and the Prime bags are vacuum sealed. The larger amounts, not on Prime, are closed with a wire tie and then are sealed inside a box. I should definitely take steps to provide some sort of seal, even if it’s just a strip of labeling that goes across that closure to show that the bag hasn’t been opened. Thanks for your concern and thanks for your support! Hi Debra: Unfortunately Amazon is the only way for you to purchase our muesli if you live in the Portland area. We used to sell at Wholefoods AND at New Seasons Market in bulk. There was a misunderstanding with WF and they discontinued our muesli despite steady sales. New Seasons changed distributors. I suppose you could lobby either or both of those stores to carry us again and then you could get it there rather than on Amazon. Sorry for the inconvenience and thank you so much for you desire to continue purchasing our muesli!